If you need assistance with your garage, you’ve come to the right provider! In 2003, we began providing high quality garage floor coating in Duncanville, TX after we wanted more out of our own garages. While we were unable to find the services we wanted within the industry, we didn’t let that stop us, but instead, we decided to join the industry ourselves. 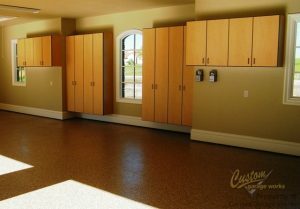 We now provide our clients some of the best custom garage solutions available, including top quality cabinets and incredibly durable floor coatings that are superior to epoxy coatings. Our team of experts is dedicated to providing DFW with premium garage solutions and garage floor coating. Out of all of our services, our most common services is the polyurea polyaspartic floor coating in Duncanville, TX. This boom in popularity is likely because our coatings are stronger than epoxy, and cure faster, which means that you can use your garage within 24 hours in most cases. While with epoxy floor coatings, you have to avoid UV exposure and watch out for flaking, our polyurea-based floor coatings are significantly more durable. In addition to our floor preparation, which incorporates professional diamond grinding, instead of acid etching, the end result is a showroom quality floor that is easy to clean, and practically indestructible. If you’re looking to learn more about our reliable garage floor coating services, give us a ring at 214-494-9068 or 817-308-1305 and schedule your free estimate! Epoxy Coatings Epoxy coatings are generally inexpensive, and have a cure time of 5 to 7 days. Polyurea Polyaspartic Coatings These coatings have a faster cure time than epoxy, and are resistant to UV rays and discoloring. And More! If you would like to discover more about the services we provide, you can check them out here! Thanks to Custom Garage Works’ storage solutions, you never need to be concerned about running out of space in your garage again. 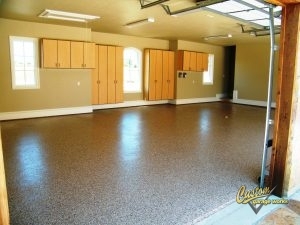 We recognize your new garage floor coating looks best when it is not covered by a mess of belongings! We have many solutions to your garage organization problem, including garage cabinets and overhead storage racks. All of our Bulldog cabinets are secured to the wall for added safety, and our overhead storage racks are stronger and more reliable than many others you’ll find on the market. At Custom Garage Works, we are committed to applying the optimal garage floor coating in Duncanville, TX, and designing the most effective organization solution for our clients, and we hope to see you soon! Overhead Storage Racks When you want to get more from your overhead storage space, our overhead racks provide safe and dependable storage. Storage Cabinets Unlike traditional cabinets, ours are designed specifically to help you get more out of your garage space! Car Lifts Our car lifts let you keep your cars with style and accessibility, and they will not scar your new floors!